If you’re looking for a convenient and downright fun way to commute, you can’t go wrong if you choose one of the best adult scooters. To help you find the right one for your commute or just for kicking around on the weekends, we researched a range of new and best-selling products. The result is this top 10 list of the very best ones around. Before we get started, let’s take a close look at what you need to know when shopping. Type: There are two types of adult scooters: electric and kick. Electric doesn’t require as much work from the rider, obviously, but you do need to worry about battery charge and distance traveled. 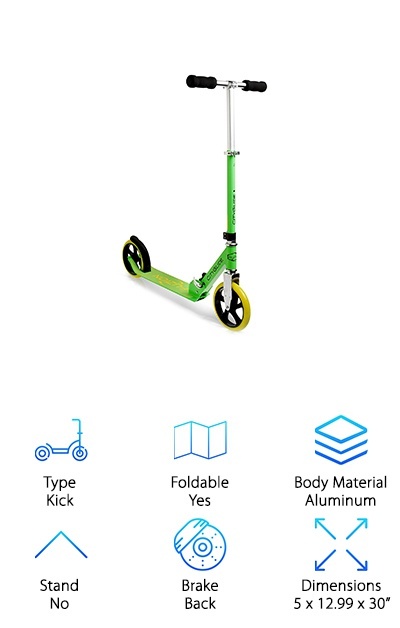 Kick scooters are 100% manpowered. Foldable: If a scooter is foldable, that means it’s much easier to store and transport. If you’re planning to take your scooter with you on the train or bus, it’s essential that it folds to a convenient size. Body Material: There are a few different materials to consider, including aluminum and carbon alloys. What you really need is a material that is lightweight enough for you to carry without making too much effort. Make sure it’s durable, too. Stand: Having a stand is a really good feature because it allows you to take better care of your scooter. Think about it: little kids just throw their scooters and bikes on the ground when they’re done. Don’t do that. Brake: Most electric scooters have a rear and/or front brake. Some kick scooters do, too, but since they’re primarily powered by the rider kicking, some also depend on the rider being able to stop without the help of brakes. Dimensions: Size is important for a few reasons. If you’re tall or have big feet, you need a bigger scooter. That said, the smaller it is, the easier it will fit on the bus, train, or in the trunk of your car. 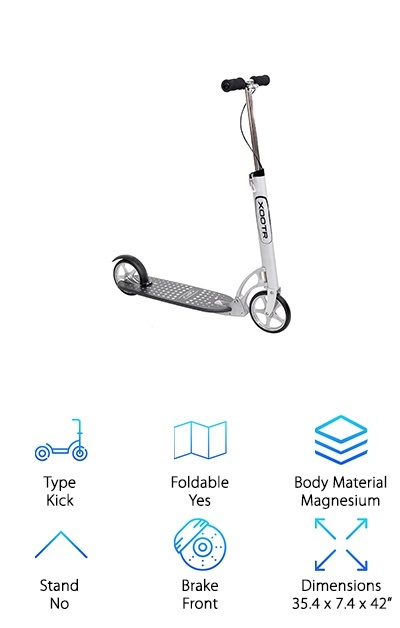 Maybe you’re wondering what’s the best razor scooter for adults but want some other options. 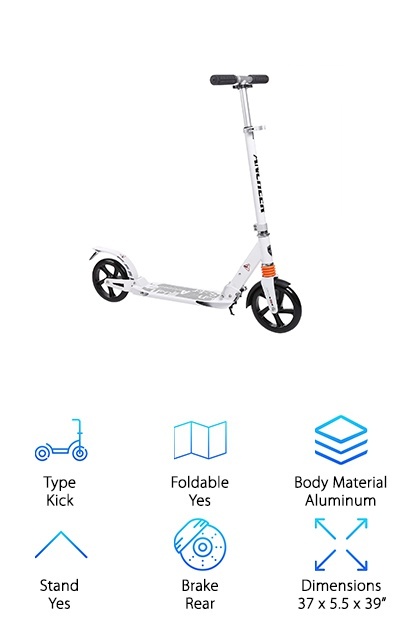 Well, now that you have a better idea of what to look for when choosing an adult scooter, let’s get right to our reviews. If you’re in a hurry, check out our top pick and budget pick. Both are great choices and you’ll get a little taste of the variety that’s out there. After that, you’ll find our runners-up. Okay? Let’s go! There are a lot of reasons why we’re calling this our best electric scooter for adults. For starters, the tires are made of military tech honeycomb. What does that mean? They’re airless so you’ll never have to worry about them going flat. It’s self-standing and folds up to a compact size. Once it is folded, you can easily tote it around like you would a roller bag suitcase. It even has a retractable handle. One of the best things about this scooter is the battery life. The lithium-ion battery lets you ride at 15 mph and gives you a 15-mile range. Don’t worry - there’s an indicator light that lets you know the status of the battery’s charge. If you live in the city, this is a great alternative to walking or even driving your car to work! 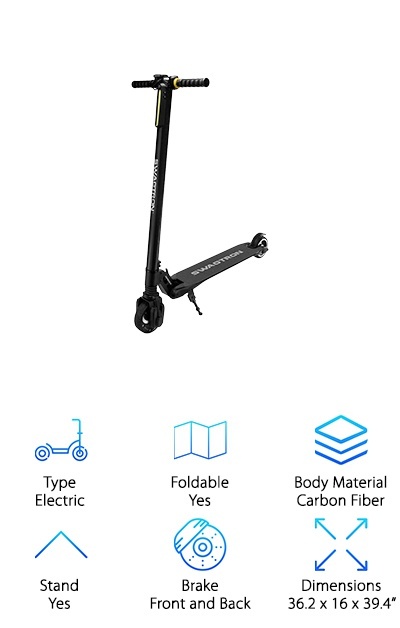 If you’re looking for the best kick scooter for adults to zip around downtown with or to explore on the weekends, the Fuzion Cityglide Adult Kick Scooter is worth a closer look. It’s our budget pick so it won’t break the bank. That doesn’t mean it’s not full of features! The lightweight aluminum frame and innovative folding system make it really easy to store and transport. Plus, you can ride on different terrains thanks to the traction of the oversized wheels. It can hold up to 220 lbs and, here’s the kicker: it has a telescoping handle. Why is that such a big deal? Because it adjusts to different heights! If you’re on the tall side, you don’t need to worry about uncomfortably bending over to reach the handlebars. Hands down, this is our best kick scooter for commuting. First of all, the handle is adjustable and can accommodate riders up to 6’7” tall. And if that wasn’t impressive enough, it’s made to hold up to 800 lbs. It also has a wide platform with enough room to comfortably hold 2 feet. In other words, this one was made for adult feet. The tires are made of polyurethane and have one of the lowest rolling resistances of any scooter. It’s fast and stable plus it folds up quickly once you’ve finished your commute. These scooters are handcrafted in Pennsylvania and it’s easy to see how much time and dedication go into making each one. Oh, and one more thing. If you’re wondering why this scooter is so awesome, it’s probably because the people who designed it normally design racecars. One reason that we picked the Swagger Electric Scooter as a best adult electric scooter is because of its range. At a top speed of 16 mph, you get 5 to 18 miles with this one. Pretty impressive! You can go farther and adventure a little longer than with other electric scooters. If you’re worried about how much power you have left or if you just lost track of time (because, hello, you’re riding around on a super awesome scooter), check your battery life directly from the dashboard. Your speed is displayed there, too. There’s more. 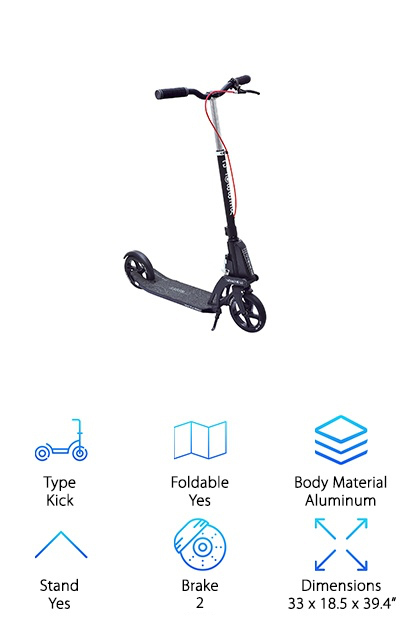 This choice for the best electric scooter has a front suspension that makes going over bumps a lot smoother. The carbon fiber frame is strong enough hold up to 250 lbs. If you commute and you can’t ride your scooter all the way to work, simply hop on to get from your house to your bus or subway stop. Once you’re ready to get on public transportation, don’t worry. 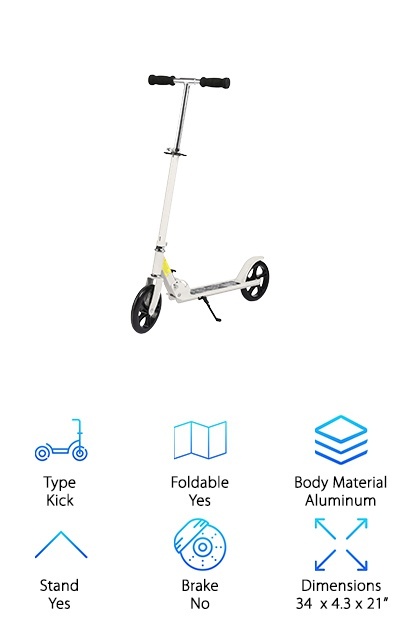 This kick scooter has an easy folding system that makes it compact enough to easily take it on the bus or train. Not only that but it’s made of lightweight, durable aluminum so it’s not too heavy and will be able to tolerate some dings. When you get to the office, fold it up or use the stand to store it upright while you work. That’s not all. The handlebar is adjustable so it’s great for anyone on the tall side. This kick scooter was designed to hold up to 140 lbs. Not only does this scooter from Oanon give you a great ride. It just looks awesome, too. It’s available in white, black, blue, and red. The wheels are large and come equipped with high-quality bearings. Why is that important? 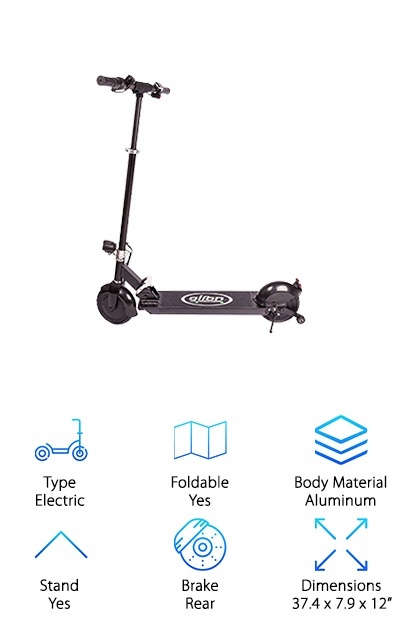 It helps this scooter have minimal vibration and that means a smooth ride for you. There’s no assembly required, just adjust the handlebar and you’re ready to go! Another great feature? The soft sponge handles make it comfortable to hold. Plus, it’s easy to fold and lightweight so you won’t have any problems transporting it. 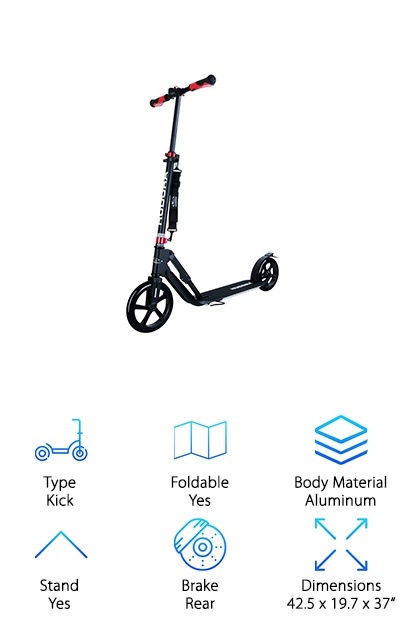 This is another option if you’re looking for a scooter to commute with. It’s nice, smooth ride will get you to the train still looking fresh and you’ll have no problem taking it on board. This is one of the strongest scooters we came across in our research. You might be wondering why we said that. While most adult scooters are rated to hold up to 220 lbs, this one can hold up to 264.5 lbs! This is really great for anyone over the standard weight limit who really wants to get in on the action. Another reason this is great for larger riders? The handlebars adjust all the way up to 41.9”, perfect for tall people. This one is also lightweight and foldable and has a rear friction brake. And get this: it has a shoulder strap! This makes it really easy to carry. And that’s not all. It’s made by a German brand and passes strict German safety standards. 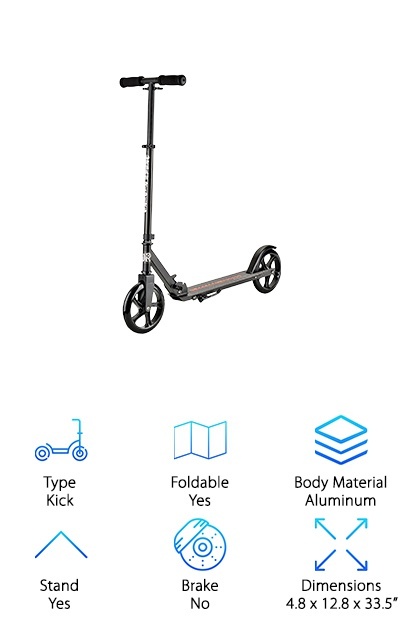 The Globber Adult One Kick Scooter has a folding mechanism that helps you fold up the scooter with minimal effort. You can even lock it so it leans against the wall without rolling away. The aluminum frame is sturdy and durable and holds up to 220 lbs. Plus, the handlebars are adjustable for riders of all sizes. If you want to ride this one outside, the quality mudguard makes sure you won’t get messy. The wheels are also large and mounted with high-quality bearings and cores so they have great rebound if the concrete isn’t super smooth. 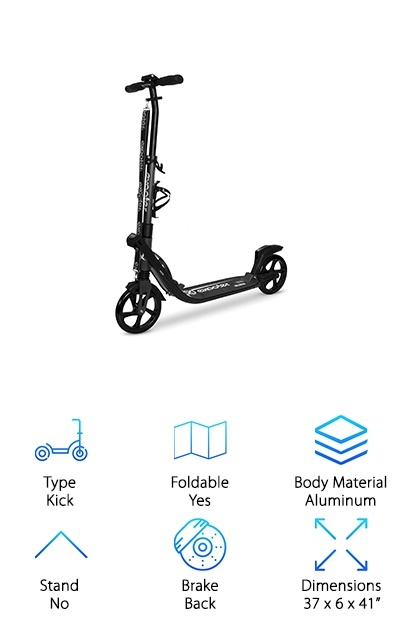 This is one of the newest additions to the Globber line, a huge French scooter brand. It’s designed not only for quick and simple commuting but to also take you on outdoor adventures. This is another gorgeous looking scooter with so much to offer! It’s lightweight and folds for easy transportation and storage. There’s even a carrying strap! If you’re riding on uneven pavement, the large wheels and high-quality bearing help keep your ride smooth. Plus, you get front and rear suspension shocks. This is a scooter that was designed to be able to handle potholes and rough surfaces. It’s great for long distances! Oh, and get this: it comes with a cup holder! That’s right, you can carry a 32 oz beverage along with you on your ride. Whether it’s cold water for days exploring to terrain or iced coffee on your way to work, this is a little something extra. One of those things you never knew you needed until you have it. There are good folding mechanisms and then there are great ones. This scooter has a great one that takes 1 second to fold. Perfect if you’re in a hurry during your commute. With dual wheel suspension and precision bearings, you’ll also get a smooth ride when on sidewalks and other pavement. The rear brakes are anti-rust and work to bring this scooter to a stop, fast. The handlebar is adjustable and great for anyone on the tall side. Not only that but they have comfortable padded handles to make your ride even better. The deck has a good amount of foot space and a non-slip surface, too. Plus, it’s low to the ground and easy to and maneuver. It’s made of aircraft grade aluminum alloy so you know it’s lightweight and really durable.